"No More Paper Songbooks" and "No More Printing"
E-Songbook is an electronic songbook that manages the song lists of Karaoke / Music players. It can display more than 200,000 songs in 40 different languages using a single or multiple list layout. Imagine "No More Paper Songbooks" and No More Printing". 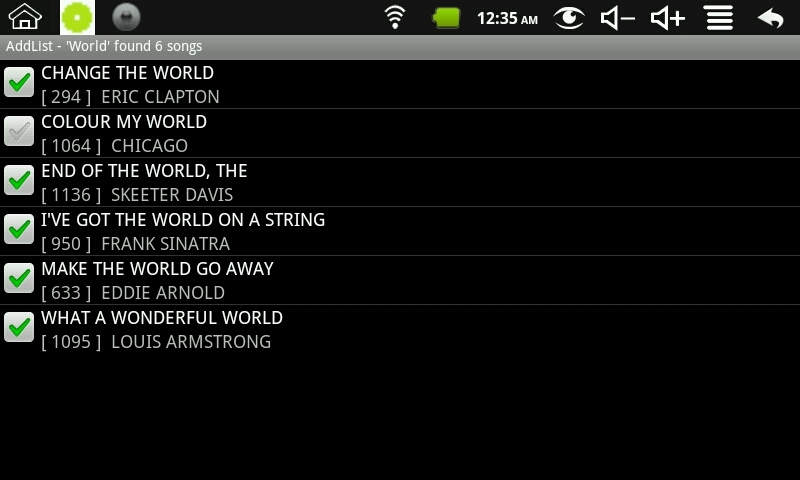 E-Songbook can instantly sort and search the songs by index, title, or artist at a touch of your fingertips. 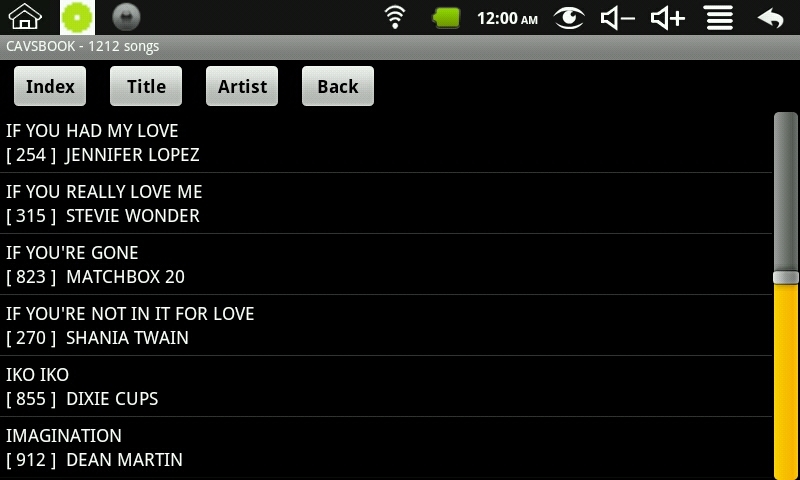 It can also scroll through the song list and jump to any page with a single touch. 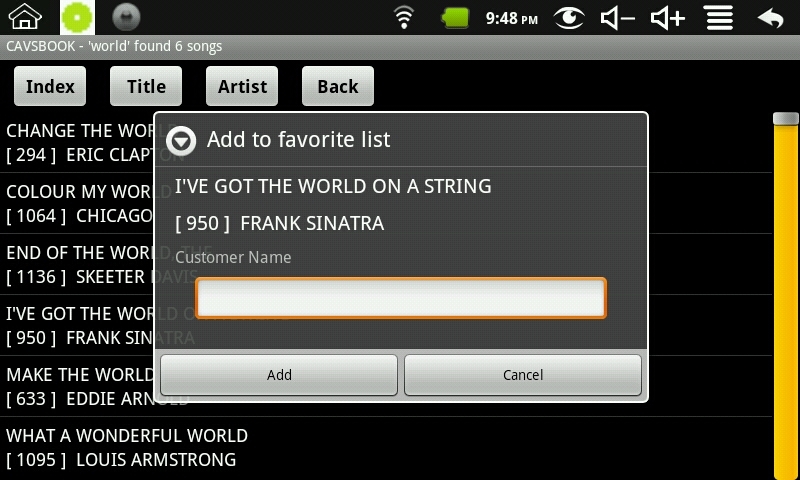 E-Songbook can create and manage unlimited number of Favorite Lists for customers. 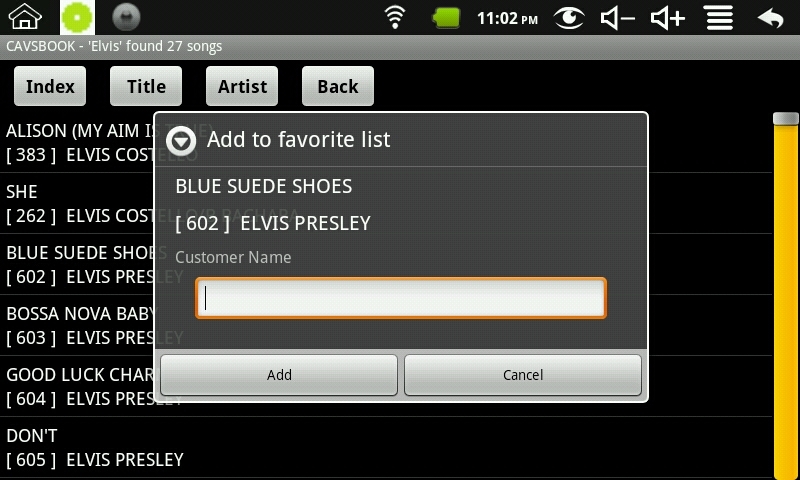 It can store the favorite songs for each and every customer in separate lists for easy and quick access. E-Songbook can receive and display messages, such as who is next to sing, the last call for drinks, or someone left his lights on. It literally rings in the messages without disturbing your use of the E-Songbook. E-Songbook can remote control to reserve, play, stop, select, or cancel the songs directly into CAVS JB-199s, CAVS Karaoke Laptops, CAVS Touch Screen AIO PCs, and CAVS PlayCDG KJ Deluxe 64 LT players. You can enable or disable this powerful feature for each E-Songbook individually or for all E-Songbooks together. E-Songbooks, up to 256 units, can communicate simultaneously with a single CAVS Karaoke player or any Windows based laptop / PC. The communication is based on Wi-Fi Intra-network. It does not need Internet connectivity that may or may not be available in local bars or restaurants. E-Songbook is a powerful Touch Screen Tablet with Android 2.2 / 2.3 OS. It requires no mouse, no keyboard. 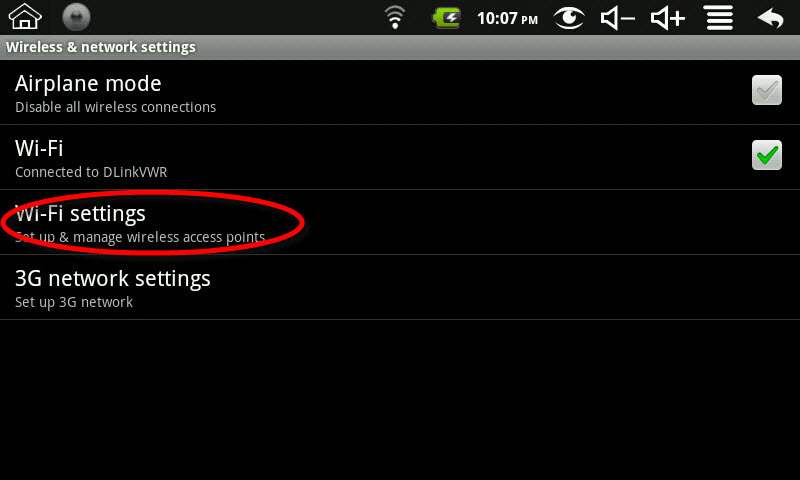 It imports the song list automatically using WI-FI, or using micro SD card. E-Songbook will surely enhance your karaoke fun with the latest network technology. 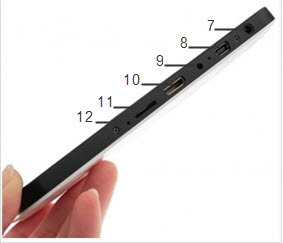 If you have an iPhone, iPad, Android Smart-Phone or Tablet (such as HP, Motorola, Samsung, etc. 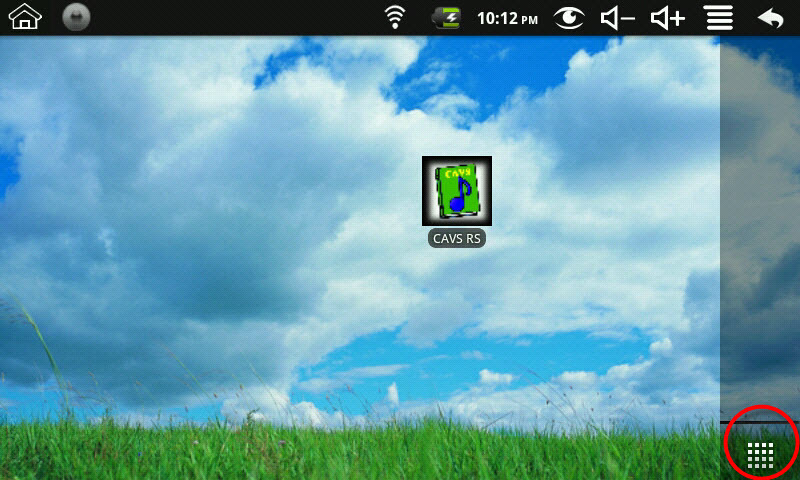 ), you can simply install the CAVS RS II Apps free of charge and turn your devices into an E-Songbooks. Please go to iPhone & iPad or Android Smartphone & Tablet for detail instructions. The first step in setting up the E-Songbook is to confirm the proper running of CAVS RS II Server program in your CAVS Karaoke player or Windows based PC. For details, please go to CAVS RS II Server program. Turn on the E-Songbook by pressing the Power switch (usually for 2 - 3 seconds). After the initial sequence, the main Home page will appear with the CAVS RS icon. Press the Application window. Tap on the Settings in the Application window. 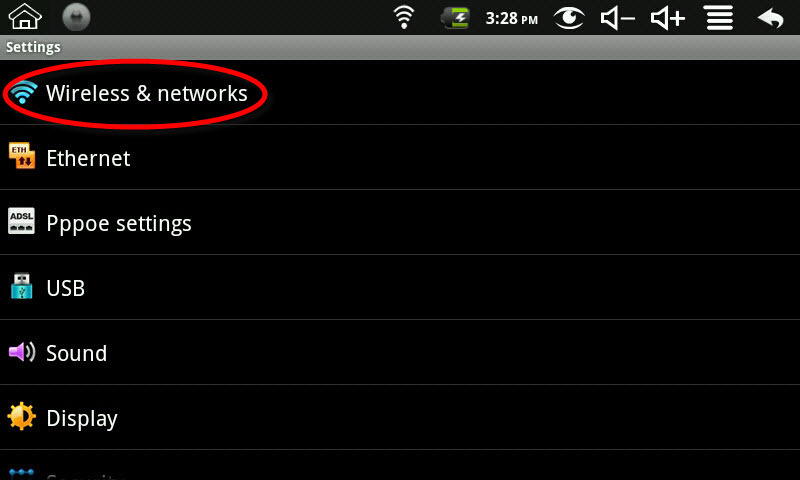 Tap on the Wirelss & networks. Under Wi-Fi networks, find and tap on the wireless router connected to the CAVS RS II Server program (for example, CAVS Router). Next tap on Connect to connect the E-Songbook to the router. If the router is password protected, input the password. 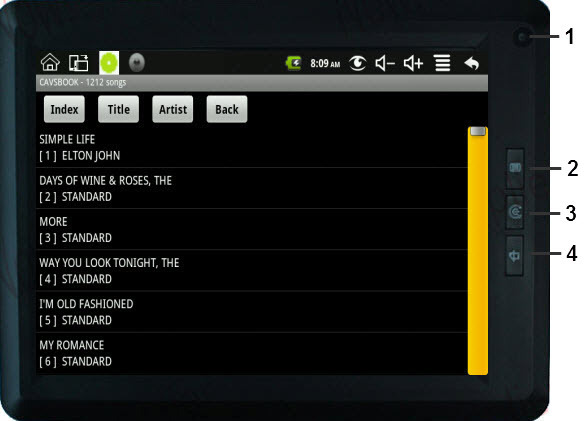 E-Songbook can also be used as a stand-alone unit without the CAVS RS II Server program without a connection to CAVS Karaoke player or Windows based PC. In this case, the E-Songbook can be used only for searching and the song list will be imported using a micro SD card. Import the song lists using a micro SD card. Select songs using Search, Sort, and Scroll. After finding a song, customers will need to rely on a conventional method, such as paper notes, to pass the song selections to KJs. Create a song list (.txt file) in the CAVS RS format. 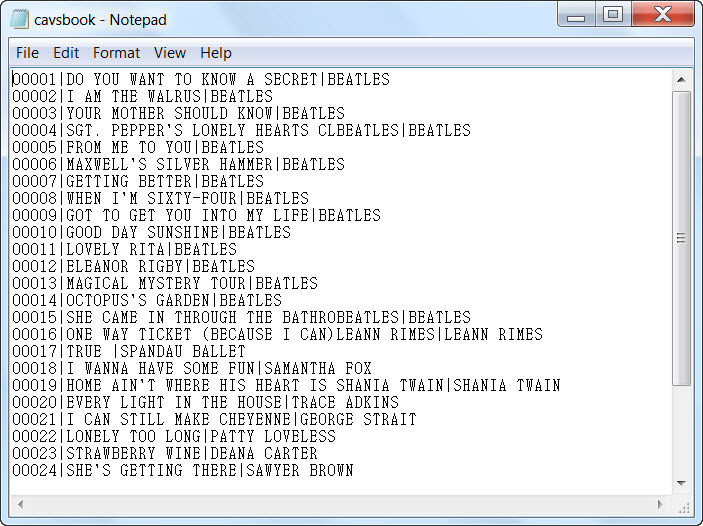 Name the song list (.txt file) as cavsbook.txt and copy onto a micro SD card. Turn on the E-Songbook by pressing the Power switch (usually for 2 - 3 seconds). 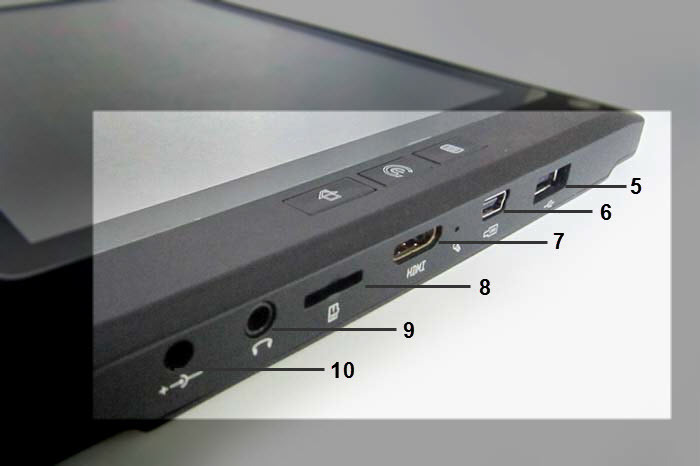 Insert the micro SD card into the E-Songbook. Display more than 200,000 songs in 40 different languages. * available when connected to CAVS Karaoke player. 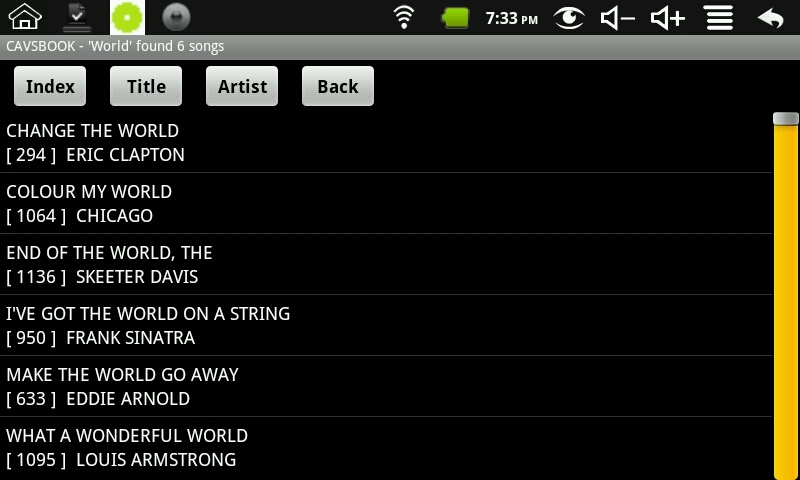 In the Home window of E-Songbook, tap on the CAVS RS II icon and start the program. The Main Menu of CAVS RS program will appear with the following selections. Blue: Connecting / Importing a song list. Green: Importing completed / Ready to go. 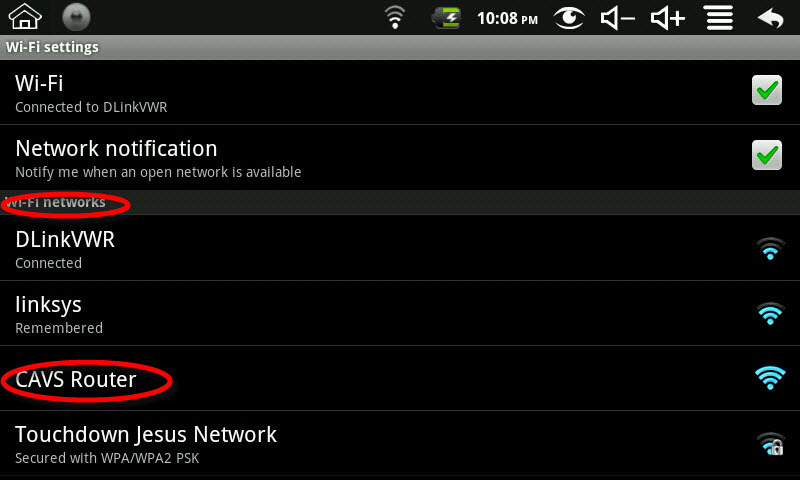 When CAVS RS II program is without a proper Wi-Fi connection, the burst icon will remain in red color. The default PINCODE required to enter is 0000 (four zeros). 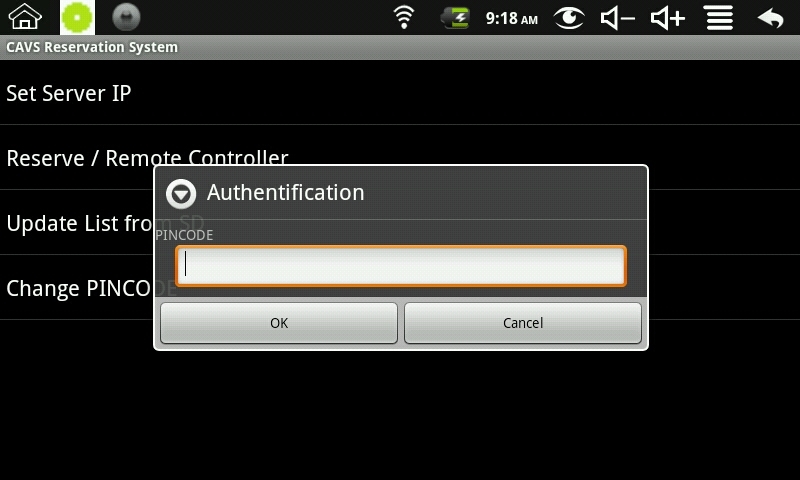 Tap on the input field to bring up the screen keyboard and type in the PINCODE. The selections inside the Settings will appear. Tap on the Set Server IP which will bring up the following pop-up window. Tap on the input field to bring up the screen keyboard and type in the IP address of the CAVS Karaoke player or Windows based PC. Press OK. To obtain the IP address, Go to CAVS RS II Server. After setting the Server IP, the color of the burst icon on the top left corner will turn blue signaling a successful Intra-net connection. 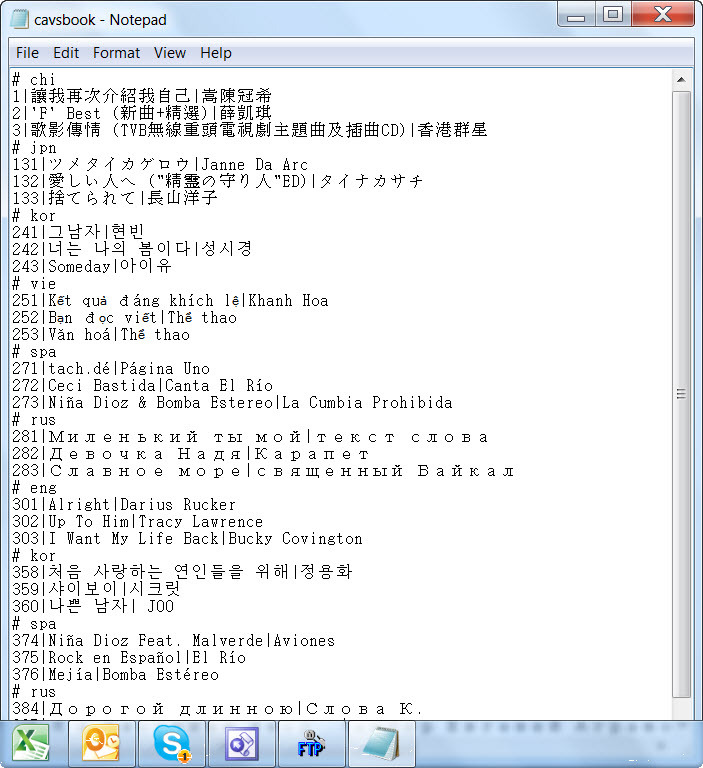 The burst will then turn green when importing the song list is completed and the E-Songbook is ready to use. Tap on Reserve / Remote Controller and the following pop-up window will appear. Select from the three levels of controls that can be permitted in the E-Songbook. Press Select. Note that the level thus chosen is only secondary to the level of controls that is assigned by the CAVS RS II Server program to all connected E-Songbooks unilaterally. 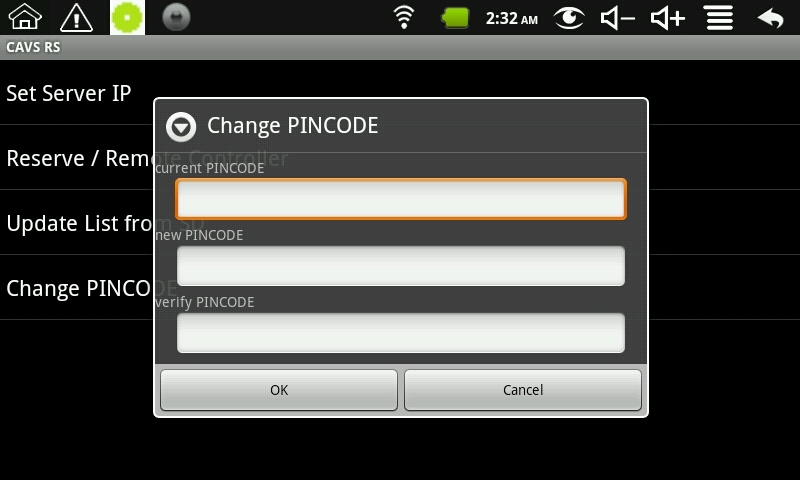 To change the PINCODE, tap on Change PINCODE. Follow the instruction on the screen. 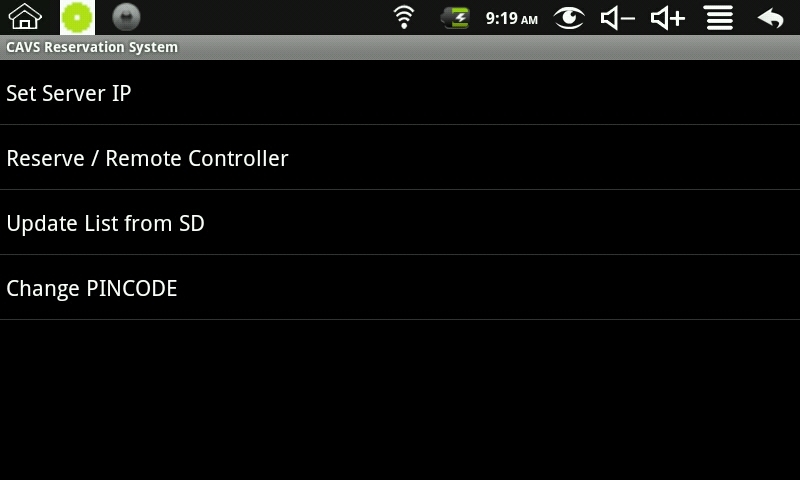 When using the E-Songbook as a stand-alone unit, you can load the song list with a micro SD card. Insert the micro SD card (with a copy of the song list) into the E-Songbook. A message "Preparing SD card" will appear on the top left corner. Tap on Update List from SD. 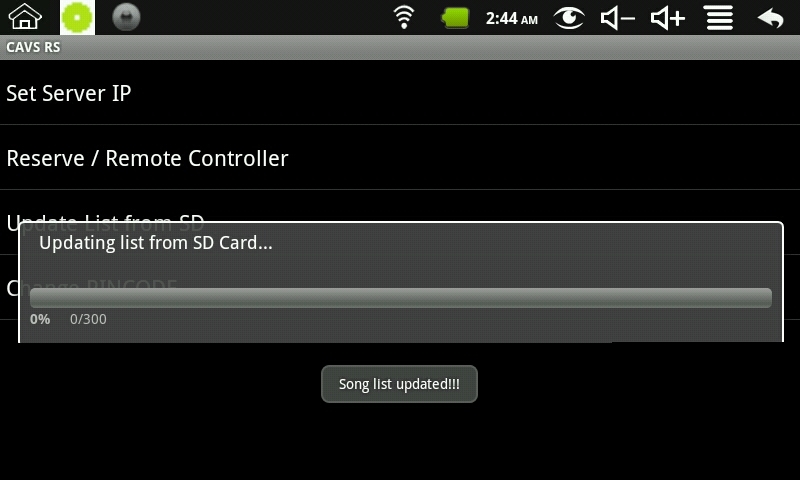 The song list in the micro SD card will begin loading into the E-Songbook. Total song list, sorted in title by default, will appear. You can re-sort the list by tapping on Index, Title, or Artist buttons. You can scroll up and down the song list with your fingertips. You can also instantly jump to any page in the song list by tapping on the yellow bar on the right. Tap on a song you wish to select. Request reservation window will appear. Press the Reserve button to reserve the song, Add Fav. button to add the song to a Favorite List, or Cancel to return. 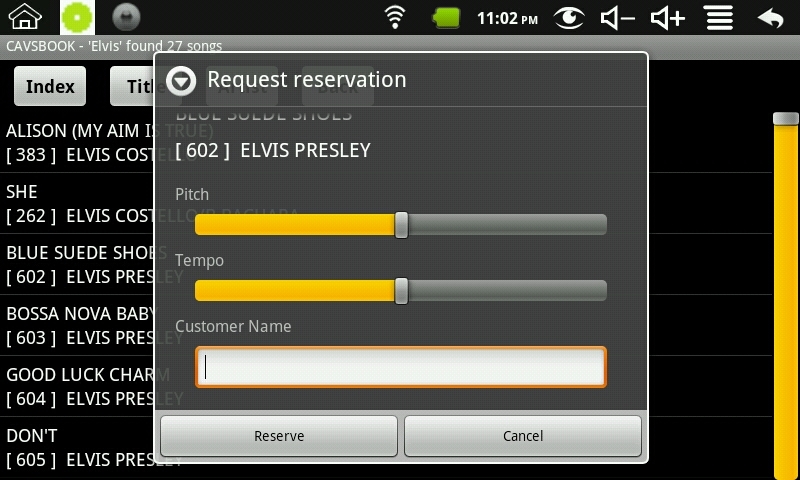 Before reserving, you have the options to preset the Pitch (Key) level, Tempo level, and the Customer Name. To input the Customer Name, tap on the input field to bring up the screen keyboard. Tap and hold a song you wish to select. Add to favorite list window will appear. Tap on the input field to bring up the screen keyboard. Type in the account name of the Favorite List or create a new Favorite List by typing in a new account name. Press the Add button to add or Cancel to return. A search window will appear as below . Type in the word you wish to search (for example, World). Press Go. Search result with matching songs will appear. You can sort this list of matching songs by Index, Title, or Artist by pressing the respective buttons. 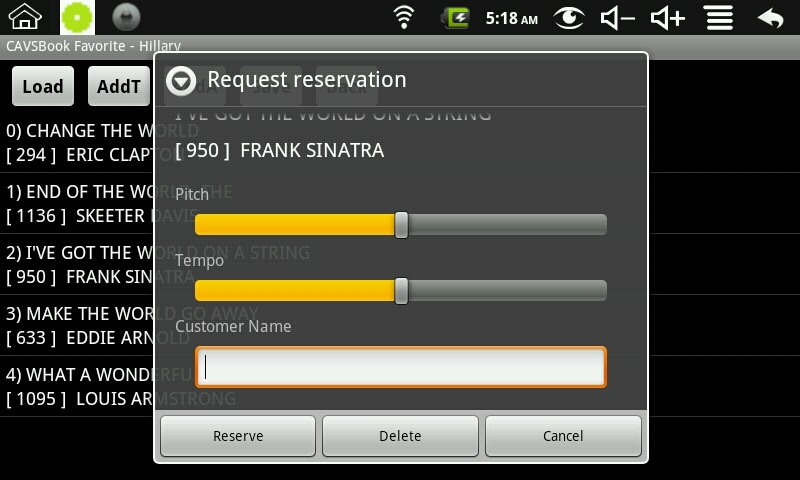 Tap on a song you wish to select and the Request reservation window will appear. Press the Reserve button to reserve the song, Add Fav. to add the song to a Favorite List, or Cancel to return. 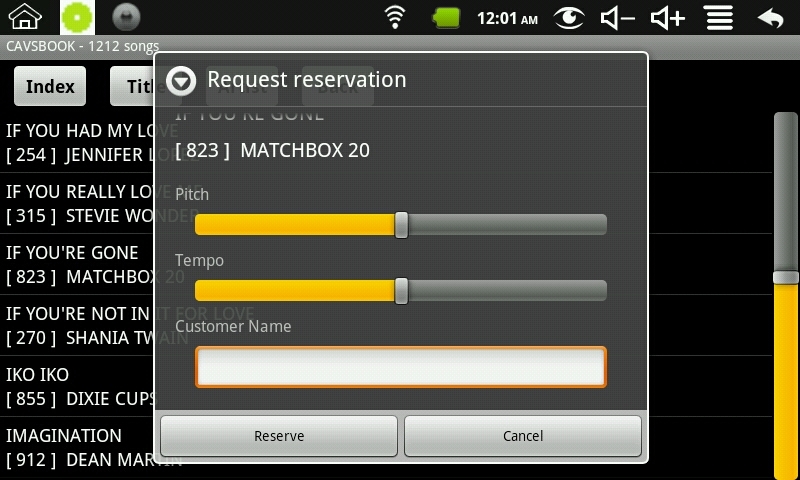 Before reserving, you can preset the Pitch (Key) level, Tempo level, and the Customer Name. 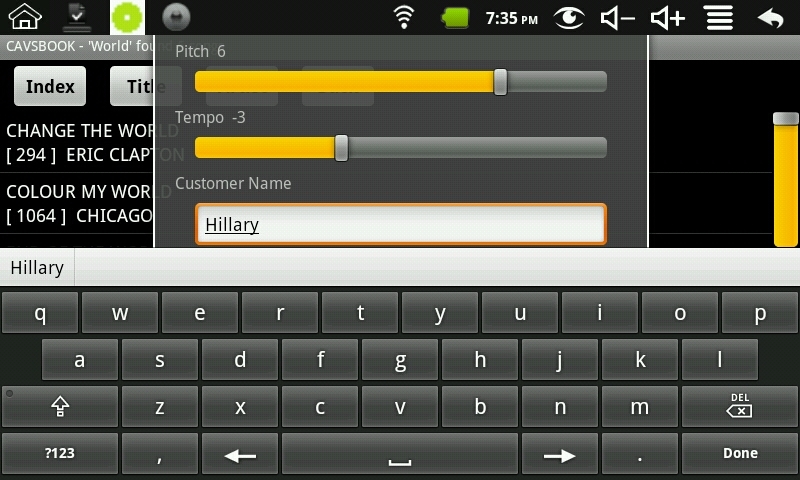 To input the Customer Name, tap on the input field to bring up the screen keyboard. Tap and hold a song in the search result to bring up the Add to favorite list window. Tap on the input field to bring up the screen keyboard. Type in the account name of the Favorite list or create a new Favorite List by typing in a new account name. Press the Add button to add or Cancel to return. A search window will appear as below . Type in the word you wish to search (for example, Elvis). Press Go. Press Load and Customer window will appear asking for the name of the Favorite List to display. If you had opened a Favorite List previously, the same Favorite List will appear by default. To change, press the Load button and type in another account name. If you wish to create a new Favorite List, type in a new account name and follow the instruction. 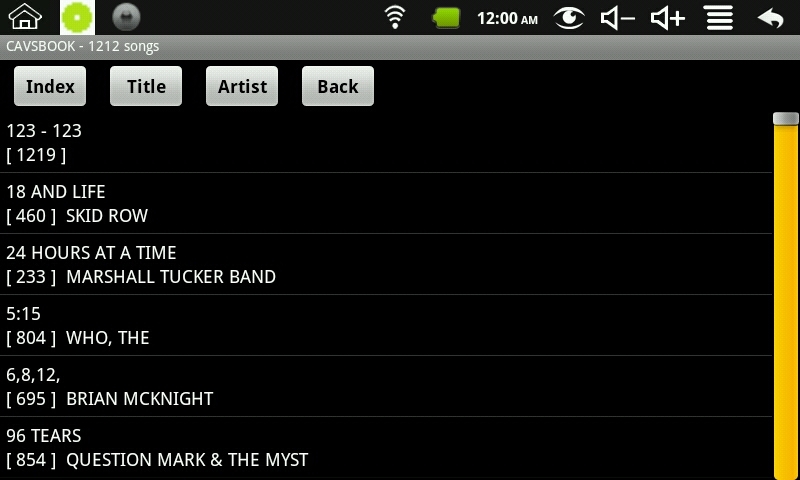 To add songs to a Favorite List, press AddT button to find songs by title or AddA button to find by artist. From a search result, select the songs you wish to add by placing check marks followed by pressing Add. Next confirm to add the songs you have selected by pressing Add button. Tap on a song and press Reserve to reserve the song, Delete to delete the song from the Favorite list, or Cancel to return to the Favorite List. The next screen will depend on your selection for Reserve/Remote Controller in the Settings. See Section 2. 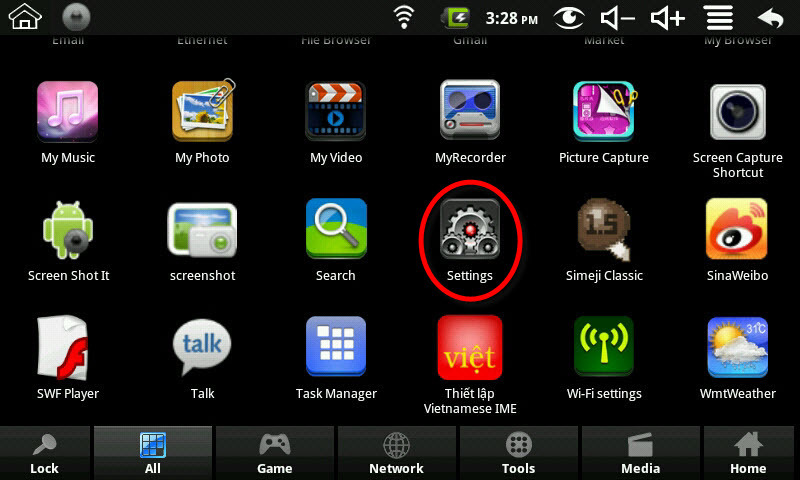 Settings for instruction of how to change the selection. 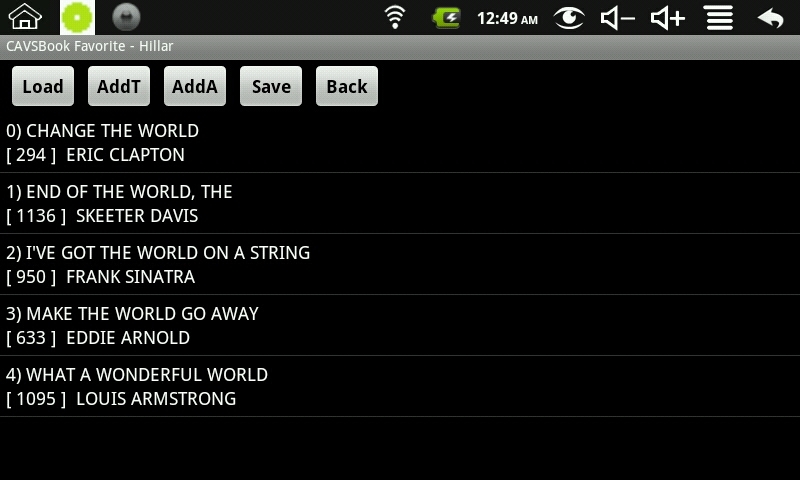 As shown above, songs can be reserved into Queue from Song Book, Search by Title, Search by Artist, or Favorite Lists. You can only browse the songs through Song Book, Search by Title, or Search by Artist, and save the songs into Favorite Lists. The Podium screen is designed as the control at the singing stage for the singers. Imagine that you have reserved a song. It is your turn and you are walking up the stage with a microphone. You check the song in the Podium screen and press Start to begin the song. Below is the Podium screen. 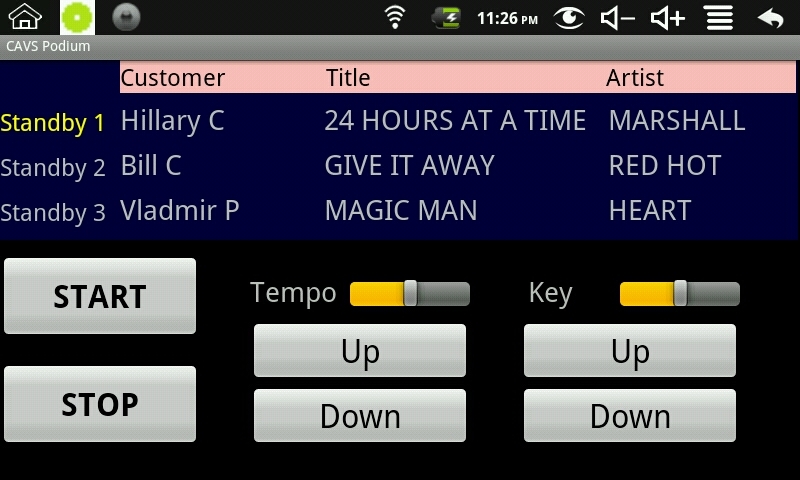 The screen shows the first three reserved songs along with the customer names. Customers can press the Up and Down buttons to set the Tempo and Key levels. They can then press Start to begin the songs and Stop to cancel the songs. CAVS RS II (Reservation System) Server program runs within host units, such as CAVS Karaoke players or Windows based laptop / PC, to communicate with E-Songbooks. Please go to CAVS RS II Server program for the description and instruction on how to operate the program.